We are sitting outside in the warm early evening. We hear music and talking coming from a nearby cherry tree. First of all we think people working in the vineyard opposite have the radio on. A little later that evening we are told that the music and chat show discussions are emanating from the radio placed in the tree as it is the only way to keep the starlings from robbing the tree of all its ripening fruit. From then onwards we call this the singing cherry tree. 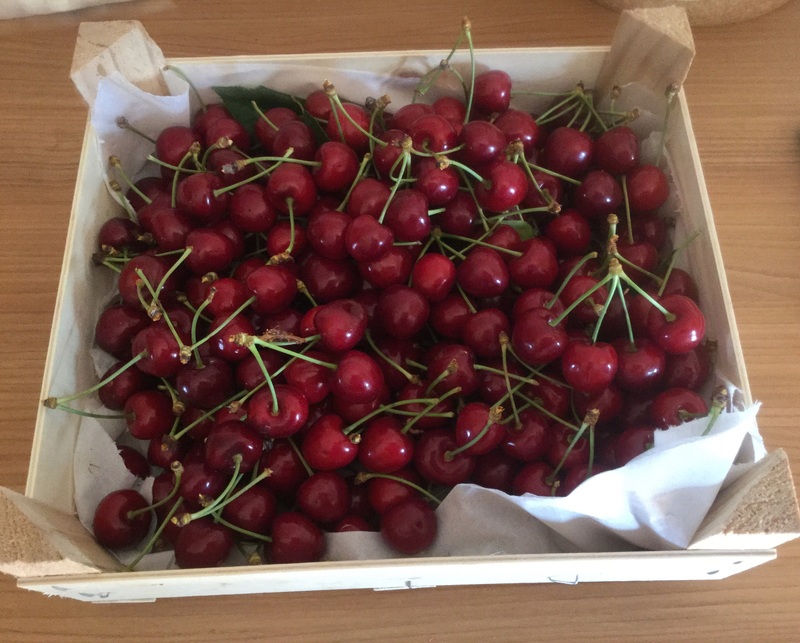 A couple of days later, we are rewarded for our patience in listening to heated debates coming from the heart of the tree with this box of ruby red cherries. I decide this number of cherries calls for more than eating them as they are. Making the French custard cake Clafoutisi seems an appropriate baking choice. 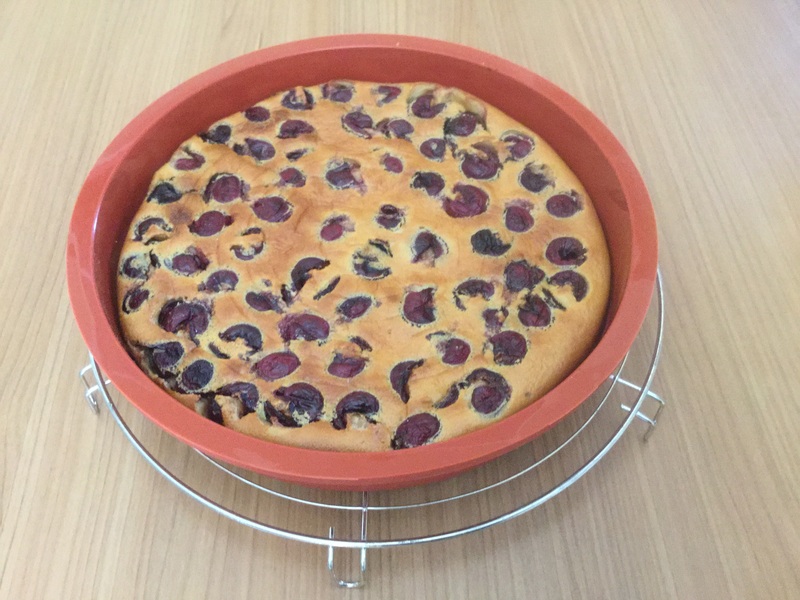 I search the Internet for clafoutis recipes and choose the Allrecipes.com recipe for Brandied Cherry Clafoutis To date, I have made three; each one better than the last and all “successful”. This particular recipe identifies canned cherries but I use fresh, pitted ones from the singing cherry tree. A couple of other variations based on ingredients on hand: I marinate the cherries in Armagnac and instead of allspice use a mixture of nutmeg and ginger. To verify that I am not straying too far from a French approach to making clafoutis, I consult a book from my late Mother, herself an accomplished cook: Mastering the Art of French Cooking by Simone Beck, Louisette Bertholie and Julia Child. This Pengiun Handbook was published in 1961 and my Mother’s copy is dated November 22, 1966. Here is what these ladies said about fruit flans or Clafoutis: ” The Clafouti (also spelled with a final ‘s’ in both singular and plural) which is traditional in the Limousin (region) during the cherry season is peasant cooking for family meals, and about as simple a dessert to make as you can imagine: a pancake batter poured over fruit in a fireproof dish, then baked in the oven. It looks like a tart, and is usually eaten warm”. This baking choice looks better and better. 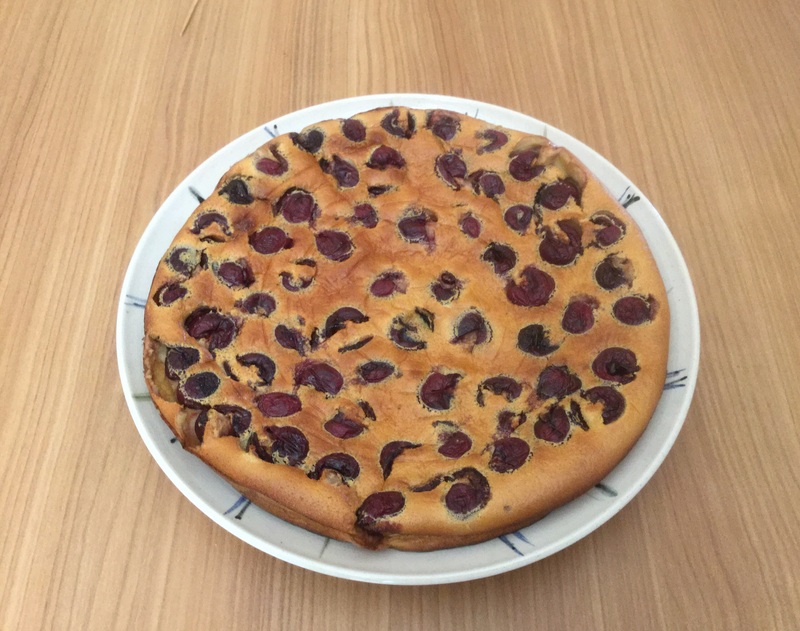 The Allrecipes.com recipe lists this general comment: ” Clafouti is a traditional French dessert with brandied cherries baked with a custard topping creating a warm and sweet dessert that goes well with a cup of tea”. This is where we part company as I see clafoutis as an ideal lunchtime dessert, served if appropriate for the occasion with a vin liquoreux. A local choice would be a wine from the Bergerac wine region: a vin liquoreux which would be either a Monbazillac AOC or Saussignac AOC late harvest wine. In this instance, I pair the Brandied Cherry Clafouti with a 2003 Chateau Lestevenie Saussignac AOC Vin Liquoreux. Chateau Lestevenie is in Gageac Rouillac, one of the four communes permitted to make Saussignac AOC wines. The fruit aromas and flavours together with the honeyed ripeness of this fully mature wine complements the cherry, vanilla, baked custard of the clafoutis. To position both Monbazillac and Saussignac vins liquoreux in the wine lexicon, think broadly in Sauternes terms. These are late harvest wines made from grapes affected by Botrytis cinerea or noble rot. The predominantly Semillon grapes are picked late in the season when the grapes have been touched by the morning Autumn mists and the afternoon sunshine. 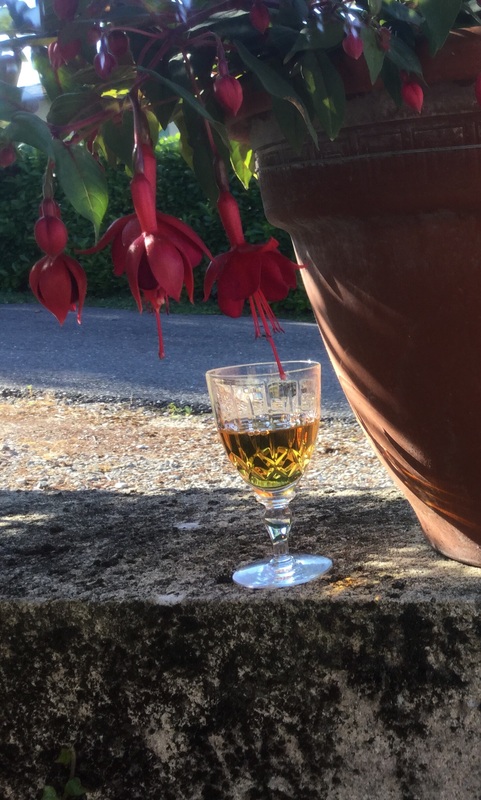 A major distinction between Saussignac vin liquoreux and other sweet wines, is that this is the only sweet wine produced in France that forbids the addition of sugar or “chaptalization” under its AOC rules. It’s the Semillon grapes which allow the wine to age well. Pairing cherries from the singing cherry tree and wine from a local winemaker is a way to celebrate the summer culture of SW France. This entry was posted in Bergerac Wine Region, culture, French Wines, wine and food, wine tasting, wine tourism and tagged allrecipes.com, Bergerac wine region, botrytis cinerea, Chateau Lestevenie, Cherry clafouti, Dordogne, French wine tourism, French Wines, Saussignac AOC, South West France, Vin liquoreux, wine and food pairing, wine tasting notes by elizabethsvines. Bookmark the permalink. What a lovely write-up. I have decided I must create a cherry clafouti today despite the fact that I have no singing cherry tree from which to pluck ripe cherries. Perhaps I can sing while making the dish to make up for it! 😉 Thanks for the inspiration. Thanks for your kind comment. I think singing while you cook the clafoutis is a great idea and something we could all do when preparing delicious food!! Bravo Elizabeth. Nice piece. I just love the vin liquoreux of this region. An how wonderful to use your mother’s recipe book for this classic dish! In my opinion clafoutis is a great way to use summer stone fruit. I agree it seems a shame not to do something more with them than just eat them! I have made cherry clafouti and also apricot and nectarine in the same way. Do you use a cherry “piper”?? I had never seen one before and came across one last summer and it was amazing to use and made de-pipping cherries so easy. Thanks again, you have inspired me to make cherry clafouitis matched with a vin liquoreux de Bergerac! Hi Craig, many thanks for your kind comments. Re pitting the cherries: I used a small edged potato peeler to pit the cherries and that worked ok. Certainly adds to the prep time but worth it. I made apricot clafoutis the other day and that was good. Apricots generate more juice when cooking so I left the clafoutis in the oven longer. I will follow your suggestion and also make with nectarines.